RubyStarlight Writer and Annette Voight is awesome. From the laser light show in Electronic, the zippered store fronts in Punk, and the NYC street scene in Jazz – you will be amazed. 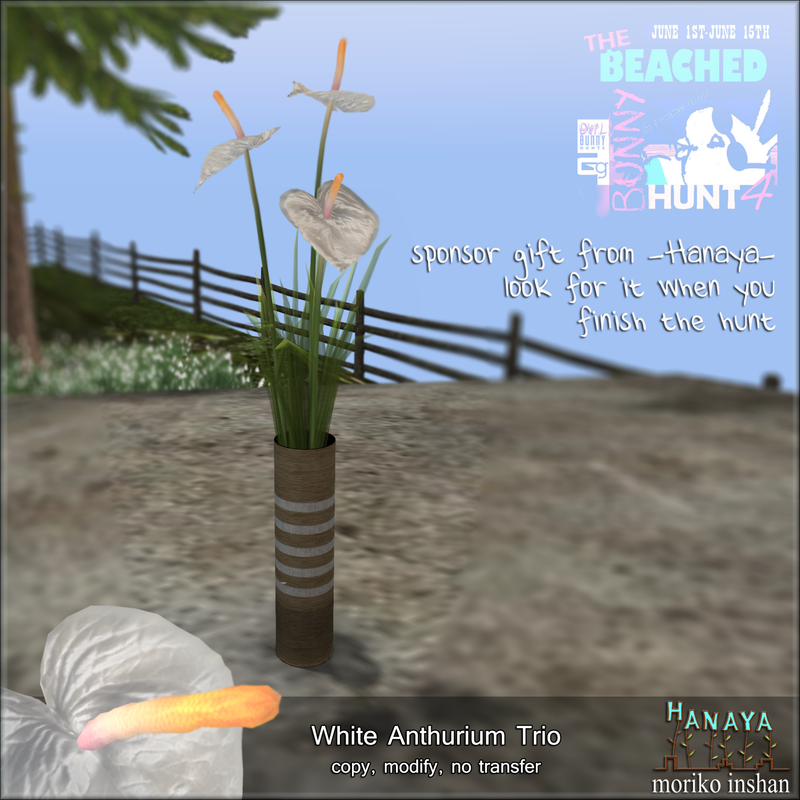 I hope you stop by the -Hanaya- booth (one of the stores at the landing point), and grab our visitor gift. 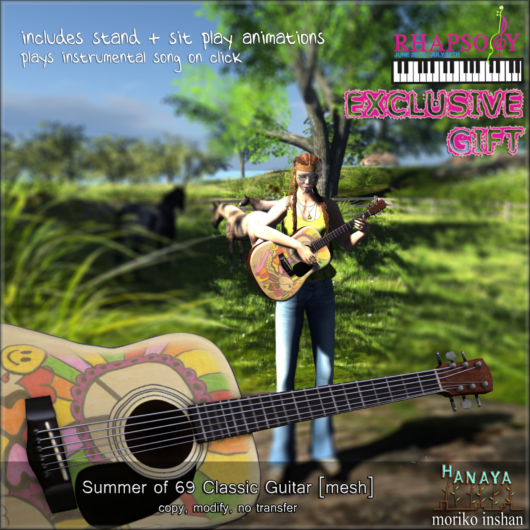 It is a classic mesh guitar with both standing and sitting ‘play guitar’ animations. Versions sized for both guys and girls are included. And it plays a cute instrumental. Rhapsody starts today at noon SLT and is on for the next 2 weeks. This entry was posted in Uncategorized on June 28, 2014 by moriko. 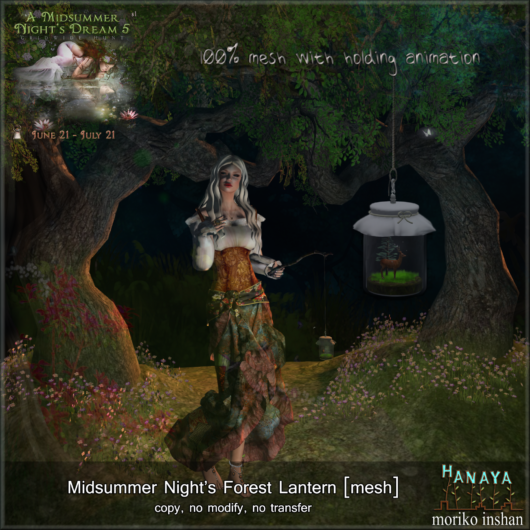 Just a quick post on a current hunt going on right now – the Midsummer Night’s Dream 5. The -Hanaya- hunt gift is a wearable mesh lantern to help you find your way in the forest. So stop by -Hanaya- in-world and come and get your copy if you can find it. This entry was posted in Freebies and Gifts on June 26, 2014 by moriko. The -Hanaya- team has been busily working on products for the Rhapsody event, which is coming up later this month. So we have been in a retro-hippie-flower-child mood. That is why this month’s VIP group gift is a little bench with a pink poppy. The bench is 2 li, and contains 3 cute menu-driven animations. The gift was sent out on the -Hanaya- Yummy Collectibles group today, and will remain in the notices for the next 2 weeks. If you missed yours, please stop by -Hanaya- in-world and get it from the Group Gift vendor. Just make sure that you have the group active first. This entry was posted in Freebies and Gifts, Uncategorized on June 4, 2014 by moriko.